For over a week now we have been a running a competition on our Facebook asking our fans to vote for their favourite Dead Daisies song. We have been blown away by the amount of votes we have got and surprised by what everyone is loving. Each week we are giving away an awesome merch pack to one lucky winner and we are stoked to announce that our fist winner is Ben Hunt! Congratulations, stay frosty as we are sending a Dead Daisies merch pack your way! Is your favourite Dead Daisies song number 1? 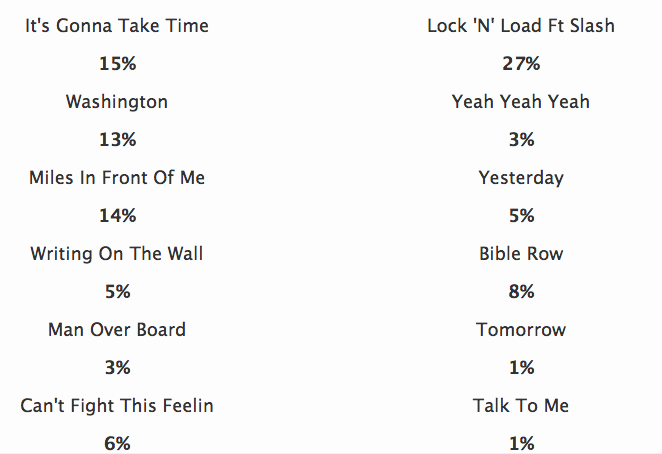 So far Lock ‘N’ Load is in the lead but lets see if an underdog can take it out. Miles In Front is catching up so who knows which will be the fans favourite! Make sure you get in quick before we announce the next winner for your chance to win an awesome prize pack.